These are my absolute favorite cookies! I love them!!! LOVE THEM!!! 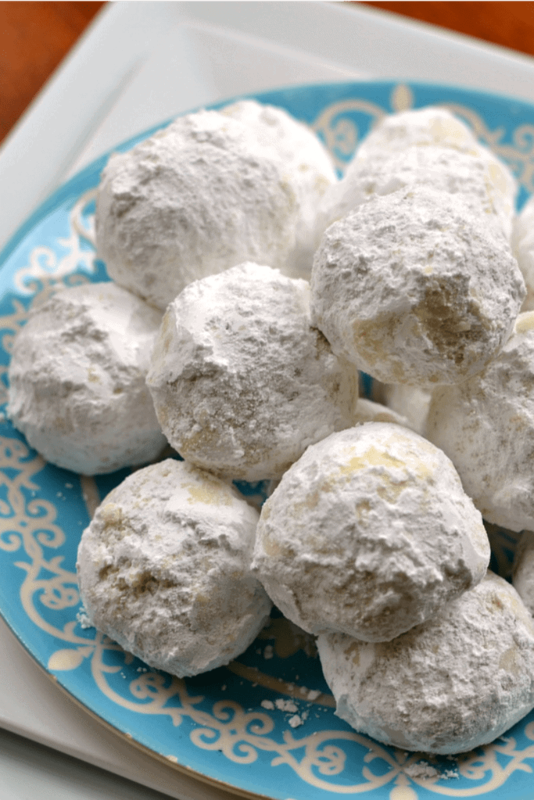 These Buttery Pecan Snowball Cookies will melt in your mouth. They are so easy! You will find that you have a full batch of cookies ready in under 45 minutes. How can you beat that!! 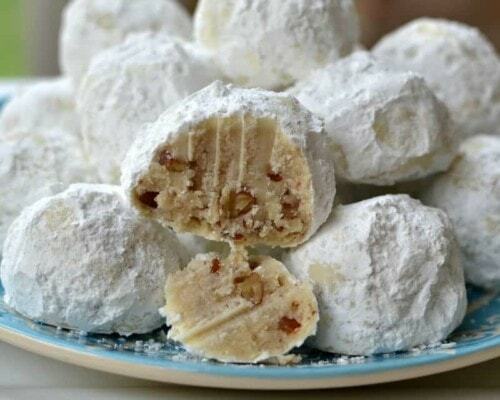 How to make Buttery Pecan Snowball Cookies. These delectable cookies are so very easy to make. First cream the butter and the powdered sugar until light and fluffy! Then turn the mixer to low and add the salt, vanilla, flour and pecans. Roll into one inch balls and place on parchment covered baking sheets and bake. Allow to cool just enough to handle them. Roll in the powdered sugar. Place them on cookie cooling racks. When they are fully cooled roll in the powdered sugar again. How to freeze and thaw Snowball Cookies aka Russian Tea Cakes and Mexican Wedding Cookies. They can be baked and frozen ahead of time. Pack the cookies in doubled Ziploc freezer bags and place them in sturdy glad-ware freezer container. When defrosting take them out of the containers frozen and place on serving trays or platters uncovered. Never allow them to defrost in the plastic and the containers. The condensation that builds in there will ruin the cookies. Once the cookies have defrosted place in airtight containers and store at room temperature for up to a week. The dough can easily be frozen as well in a practice commonly known as flash freezing. Simply roll the dough and place on parchment covered baking sheets. Make sure they aren’t touching so they don’t freeze to each other. Place in the freezer until frozen then transfer to a freezer bag and store that bag in a sturdy freezer container. When you are ready to bake simply place the cookies on a parchment covered baking sheet and let them thaw just a tad while the oven preheats. Frozen cookies may require an additional one to two minutes baking time. 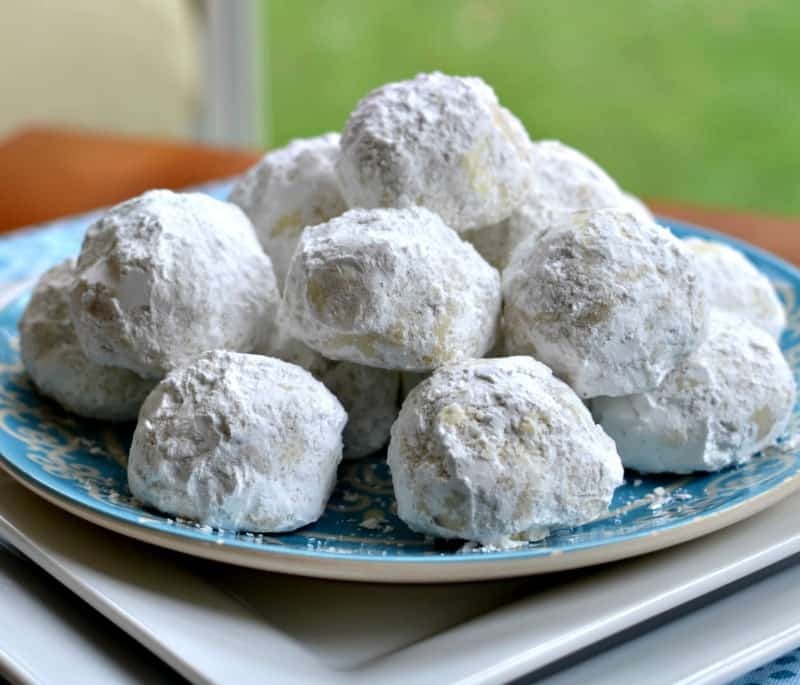 Do you have to use pecans for this Snowball Cookies Recipe? Heck no! You can use English walnuts, black walnuts, almonds, pistachios, and even cashews. Just make sure the nuts are shelled, roasted and finely chopped. Each nut gives the cookie a delicious different unique flavor. Use real honest to goodness butter so they taste yummy. Chop the nuts fairly fine. This a thick dough so roll the cookies with your hands because the warmth or your hands will help shape the cookies. Preheat the oven and load the baking sheet in the middle of the oven. Use parchment paper or silicone baking mats. If you have time do a test run with one or two cookies. It really helps to establish baking time. Do not over-bake. These are a type of shortbread cookies. They are a crumbly melt in your mouth cookie. Fun twists on the traditional Snowball Cookie. 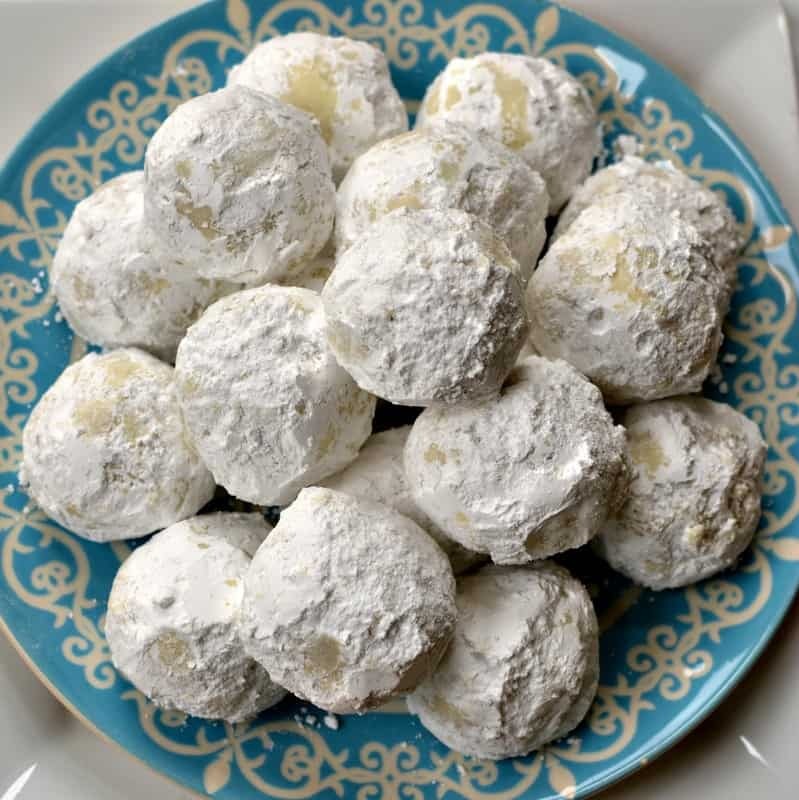 Replace the vanilla with lemon juice, add 1-2 tablespoons lemon zest and use finely chopped sliced almonds instead of the pecans to make Almond Lemon Snowballs. I love cookies but these are my absolute favorite. I just adore them. Now I gotta go freeze them before I consume all of them! I hope you love them as much as we do!! Other cookies you will love! This post was originally published October 31, 2016 and was republished November 11, 2018 with new content. These Buttery Pecan Snowball Cookies are easy, quick to fix, delicious, and they freeze well. You may even have the ingredients in your house right now. Remove from oven and allow to cool just enough to handle them. Pour 1 cup powdered sugar in large Ziploc bag or in a wide bowl. Gently add 3-4 cookies at a time and roll them gently in the bottom of the bag. Use fork to scoop under each cookie and gently shake to remove excess powdered sugar. Place on cooling racks. Once completely cooled roll in powdered sugar bag again. These sound delish and I am a big fan of Mexican Wedding cookies and butter pecan cookies soooo going to make these for a carry in at work friday…was wondering if you can provide any estimate as to how many cookies this recipe yields so I know whether to double or triple?? Thanks! Cake flour will make very light flaky cookies! Yes I am going to try that next time! Thanks for the heads up! Does this call for salted or unsalted butter? Unsalted but readers are reporting that you can use salted as well. the recipe said it yields 36 + cookies. I personally never bake less than 3 batches, they go so quick. No not usually with this dough. You can always bake a couple and if they spread too fast than the dough needs refrigeration. No it does not need to be. Happy baking! is it all purpose or self rising flour? Have you ever used coconut flour with these cookies? No I have not. Sorry. Sounds delicious though!! Yes you share can. Happy baking!!! Sure not share. I have lost my mind!! LOL!! After the 11 minutes mine are still super soft. Is that how they should be? So I was asleep and then at the doctors. How did you cookies turn out? I baked mine, a different snowball recipe, for 20 minutes. 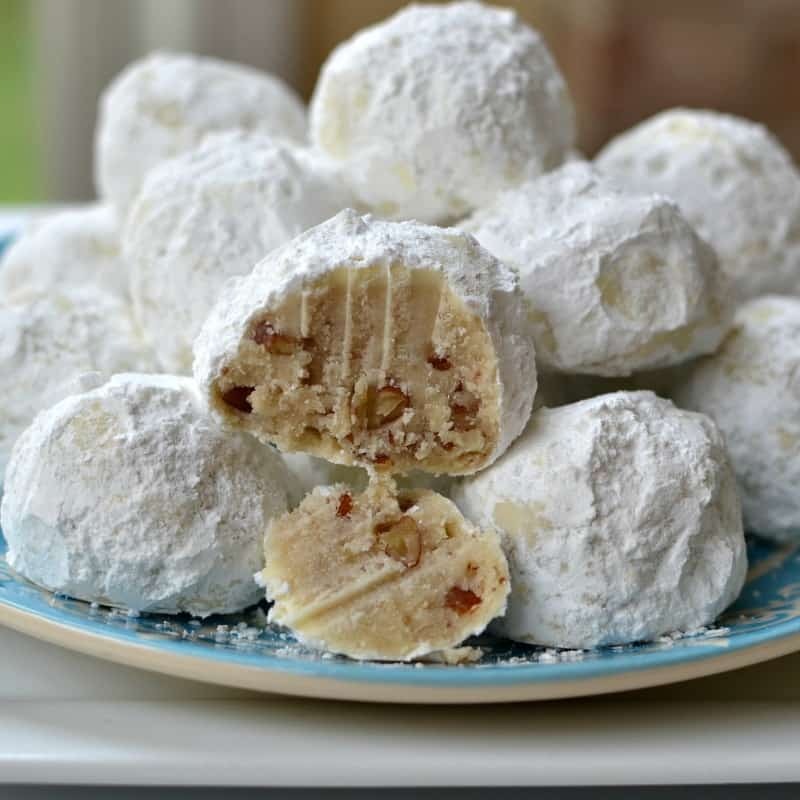 Can one store the the Butter Pecan Snowball cookies for a week or two and how would that be done. I would freeze them at that point. Let them cool completely after rolling in powdered sugar and carefully wrap in a freezer bag and then put the bag in a freezer Ziploc container. Before thawing remove from everything so that condensation does not get to the cookies. Happy baking and thanks for stopping by. I made these years ago and sooooo good. My little nieces loved them so much. these are really soo good. Yes they really are and somewhat addicting. I love them!! Wish you were on Pinterest!! Please make your recipes so they can be saved to Pintrest. I love this recipe but can not save it. I have it so you can save it to pinterest. I even create a special picture just for pinning. The buttery Pecan Snowball Cookie looks so delicious. I am planning to use it for a Christmas cookie! Awesome! They are a little crumbly because they are a shortbread so you will need to work the dough into the balls using the warmth of your hands! Happy Baking!! Hi-,I just made these cookies and they flattened out like pancakes. I tried chilling the dough, but it didn’t help. Any suggestions? A friend sent me the recipe. I think I have everything in the kitchen. May try them this morning ? Sounds like a plan. It is stiff dough so you have to work it with the warmth of your hands to roll it into balls! They are so delicious! Happy baking!! I wish there were pictures with the recipes when you print them. I am going to be updating my site in 2018 so I will certainly take that into consideration. I am not sure. Sorry! Yes, I’ve made them gluten & dairy free. I use king Arthur cup 4 cup, or my own mix. They are delish! Thanks for the heads up. Everyone has been wondering about a gluten free version. Can fresh ground wheat be used? I am sorry I am not sure. I am not used to cooking with fresh ground wheat. Maybe one of the readers can answer this! How long do you bake the cookies, and also at what temperature? and 1/2 teaspoon of almond extract. Thanks for the heads up Kathy! These cookies look wonderful! I am just wondering would you use salted or unsalted butter? Thank you! Unsalted butter please! On the “choc. chunk pecan cookies” it had a note that you could leave 1/2 the batch without nuts if desired. But it sad just add 1/2cup….but not of what. Could you tell me what the add 1/2 cup is…what ingred do you add if not the nuts? It means if you are doing half of the batch with nuts and half without you will only need 1/2 cup of nuts. Thanks Ellen. Yes they are a delicious cookie. I would also add to finely chop your pecans. Can you use cake flour? Yes you can. The readers have reported that they are better with cake flour. Happy baking! I’ve loved these cookies for decades but have never tried to make them until now. They came out perfectly. In the future, I will make them a bit smaller so the “evidence” can be destroyed in one bite and have less powdered sugar dropping off. So glad that you liked them. Yes it is important to destroy the evidence. LOL! I needed a good laugh! I can’t figure what I am doing wrong. I used 2 1/4 cups flour, 1 cup butter, and all the other ingredients. I baked them 11 minutes. But they are very crumby. What did I do wrong? Shortbread is a pretty crumbly. Have you let them cool? I wonder if you chopped the pecans fine enough? can you use margarine instead of the butter? No I would stick with butter. Found this recipe yesterday and made a double batch this morning. My family liked them so much I almost didn’t have enough to donate to my daughter’s cookie walk. I’ll definitely be making more again soon! Thank you for sharing! My pleasure Meredith! I am so glad that they liked them. Thanks for leaving such a nice message. Wonderful! I love it! Merry Christmas to you and yours! It is a shortbread cookie. Shortbread cookies do not have eggs. What make these flatten. I followed the recipe exactly. I notice someone else had the same problem. Any suggestions? My grandmother used to make these every Christmas, but she called them cocoons. I guess because she shaped them like a cocoons. She also backed them on a very low heat for about 40 minutes. Good times and great memories! Hello, I just tried your recipe and even though I accidentally used salted butter they taste great! The only issue with my batch is that they are somewhat flaky and puffy. When I bite it, it doesn’t leave the bite mark as shown in your picture. I like my snowball cookies to be moist and dense in texture. Do you know what I could have done wrong?? I am not good at baking so I don’t have general baking knowledge or experience other than following a recipe and I followed your recipe exactly. Thanks in advance! Did you use self-rising flour? I use all purpose and a lot of the readers swear by cake flour. Did you chop your pecans real fine? I would suggest for you and your taste that you cut the flour down to 2 1/4 cups. I have some people that absolutely love this recipe and others that don’t want them quite that flaky. Made these as a holiday gift for friends and they were a hit! Thank you for such a lovely cookie recipe. My pleasure! So glad that they liked them! I hope you have a very Merry Christmas and happy New Year! I put them in for 11 minutes, but they are still very soft.. do you think a few more minutes won’t hurt? What did you up doing? They will be soft when you take them out. I made the almond joy cookies you posted, they were yummy. Good morning. Did you chop your pecans real fine? You may not have done anything wrong…snowball cookies are just not liked by everyone. Not everyone has the same taste. Hi I just made these. I’m only serving them tomorrow though. Do I put the in the fridge overnight or leave them out? im confused how much milk do you use. cause my batter looks like powder. Did you use a full cup of butter which is two sticks? I will try to stay by my computer to see what your respond with. Do u have to use parchment paper? No you do not have to! No you don’t have to sift the flour although it may make them even more delicious (some cooks swear by sifting flour) and yes you can double the batch. My Mother-in-law used to make these with ground filberts and they were delicious! They are really good but I am not sure what ground filberts are. Filberts are a type of nut. The store bought wedding cookies in the pink box are my husband’s favorite. They include teeny tiny pieces of some form of chocolate chip. Do you have any suggestions on the amount that I need to add? I’ll grind them fine in my food processor. Will it mess up the recipe or cooking time if I add something to the recipe? Or should I split the total amount between the ground pecans and chocolate chips? Thanks love! I have heard of people adding chocolate chips to these but I have never tried it. I think that I would add 1 cup of semi-sweet mini chocolate chips and not change the recipe or cooking time in any other way. Of course that is just a hunch on my part. I think I will try it in the next few weeks and let you know how it turns out!! I add mini chocolate chips. They are a family favorite! Delicious little cookies. Family favorite here too!! When I make these, I drain a jar of maraschino cherries and roll the dough around it and then bake them. Awesome! Would it be OK to use almond flour? I use rum flavoring instead of vanilla…self rising flour and salted butter….always turn out fabulous. Thanks for the heads up! I love rum! I have a question i tried making snowball cookies in the past and I had an issue with the cookies just melting in the cookie sheet. Hopefull you are able to help me out with my troubleshooting! Your butter is probably too soft when you mix them. I always run a test run with one or two cookies to start and if they spread too fast put the dough in the fridge for about 45 minutes. Then try again with another test run. I know it is a bit of hassle but mixing up the dough takes time and money so you want to try to get them right.